One of my favorite places to chill in Havana is the Plaza de Armas, a shady little square just off the Malecón in the old part of town. If you get tired of walking around or it’s just too hot and sticky, this is a great place to hang out on a park bench and people watch. 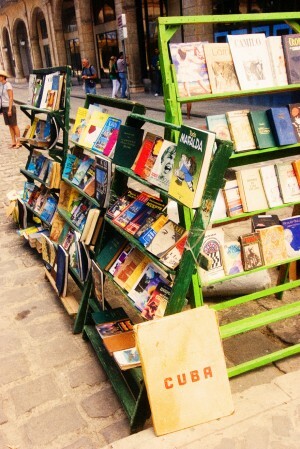 There’s a second-hand book market around the plaza that’s always interesting to check out. You wouldn’t believe how many books there are on Che. But you can also find out-of-print Cuban classics and Spanish children’s books and old Cuban maps and such. 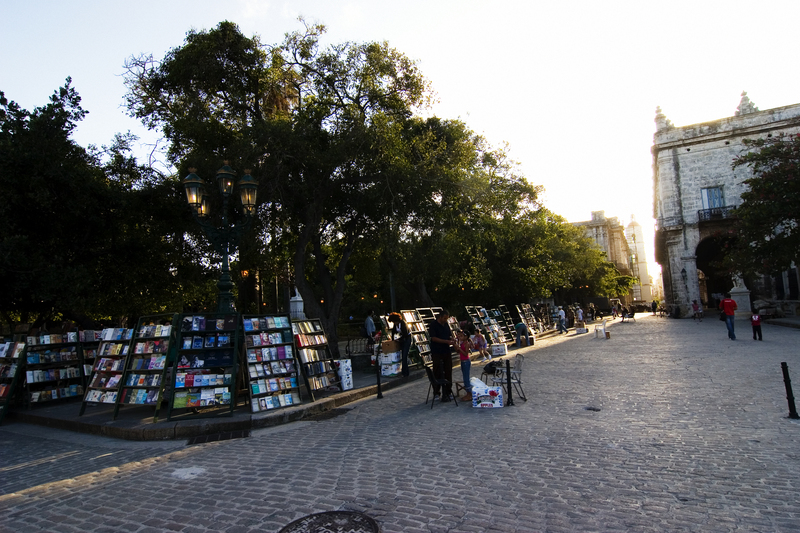 The Cuban gumshoe in Leonardo Padura Fuentes’ mystery novel Adiós Hemingway, which I loved, is a wannabee writer who scratches out a living in Havana by stealing books from the Biblioteca Nacional and selling them to the used-book vendors at the Plaza de Armas. It’s fiction, of course, but I have no doubt that some of the books being sold around the plaza have a shady provenance. So thank you Ian and Elizabeth; I enjoided the book immensely. Across from the plaza is the Greek-like temple El Templete, which Habaneros will tell you is where a mass was held after Christopher Columbus landed on the island in 1492. Of course, no such thing ever happened (Columbus ignored Cuba completely on his first voyage and the island was actually colonized by Diego Velázquez beginning in 1510 but as my friend Hardy likes to say, why let truth get in the way of a good story). Supposedly this first mass on the island was held beneath the shade of an old ceiba tree and its descendant now grows in the same spot. Again, it’s a good story with just a touch of truth involved. A ceiba tree has been growing in this spot for over two hundred years, although the original was felled by a hurricane in 1828. If you sit on a bench in the plaza facing El Templete, sooner or later you will see someone—usually a young woman—walk up to the tree and chant or sing while wrapping their arms around the white trunk. Before they leave, they’ll toss a few coins onto the roots at the base of the tree. This is all part of the santería religion which believes that ceiba trees are sacred and the place where Changó, the king of the orishas or santería gods, sits in power. And since Changó is also the god of sensuality and virility, this ceiba tree is a good place to go if you’re having trouble getting pregnant (or if you’d like Changó to help make you seem more attractive to a lover). Which explains the prayer chants and the coins at the base of the tree. 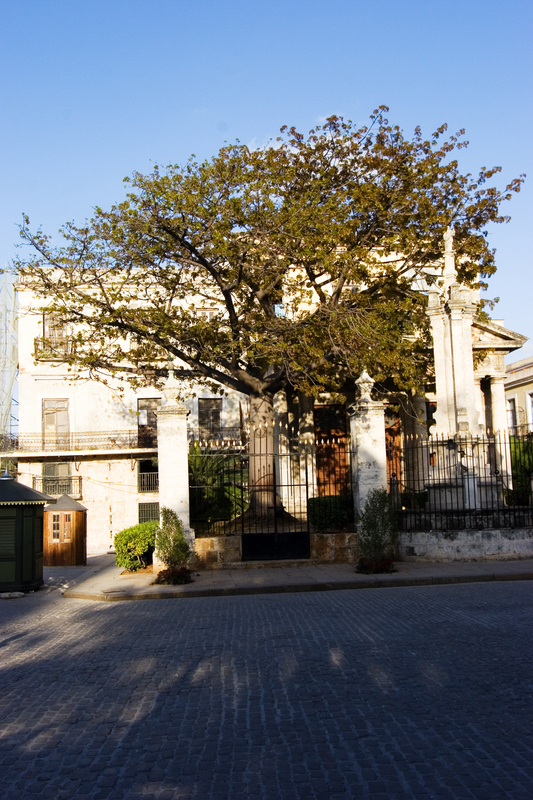 Every November 16, the feast day of San Cristobal de La Habana, lines of Habaneros mostly dressed in white, the requisite color of clothing for aspiring santeros and babalawos, take a turn around this old ceiba tree in the hope that it will bring them good luck. Since today was my last day in Havana, I took a spin around the ceiba tree as well. In fact, I went around it three times figuring if once is good, three turns has to be even better. I dropped a coin after each turn and mumbled a personal prayer—that I’ll return to this enchanting island sometime soon. I hope Changó was listening.